Today’s tarot spread is quite straightforward. 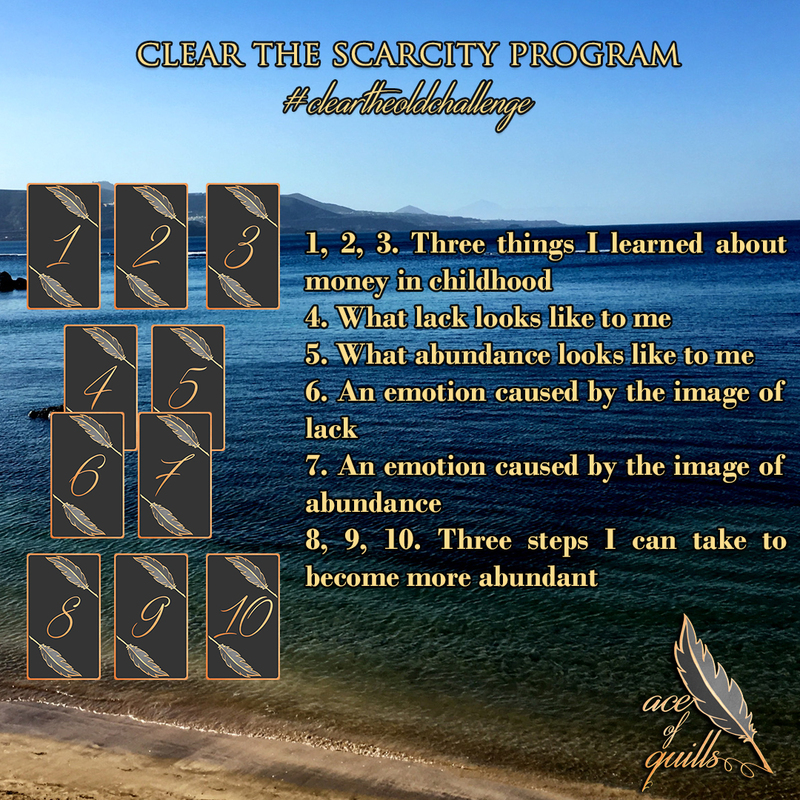 I created it hoping it would help us take a quick peek into the beliefs we hold around money, scarcity, and prosperity. I love the idea that money is energy, and all we need to do to have plenty of it is to allow it to flow freely without holding on to it, or getting attached to the way it reaches us. Easy to say, but not as easy to do. Why are we so attached to money? Energetically speaking, the more we’re attached to something, and the more we worry about it and struggle to get it, the more contraction and resistance we create. If, deep down, we believe there isn’t enough money in the world for everyone, or that by having money it means we took it from someone else who is poor now, or that money can change people, then we’re holding negative beliefs. We can’t attract something in an easy and healthy way when we believe that something is, in fact, negative. When it comes to us, our own resistant beliefs will push it away. From what I’ve noticed so far, many people don’t stop to investigate what they really believe about money, how they see it, and what they learned about it in childhood. In general, they are stressed and worried they won’t have enough to cover their living expenses, let alone enough for traveling or entertainment. It’s the kind of environment I grew up in. There was never quite enough to simply enjoy it. As a kid, if I wanted to buy myself something nice or wanted to buy a gift for someone, I had to save money for months. It’s just the way I was taught I should treat money: with utmost care, because it wasn’t easy to come by. At the same time, when it came down to comparing money to other things, such as health, family, or love, I was taught that money was the least important. So, I apparently grew up into this adult who has complete financial independence, but struggles between two extremes: I have long periods of time when I save everything and live on very little, and then I have times when I throw money out the window on expensive things that I don’t really need, simply because “it’s just money; who cares about money?”. Then, of course, because love and friends are more important, I often lend money to others and never get it back. Brilliant! These are just some of my old programs playing in the background. I’ve been managing them well enough to be able to build a good living while doing what I love most, but I’m aware that they still affect me in ways I can barely understand, let alone control. This tarot spread will lead into the next one. Pay attention to the beliefs you unearth now, because you’ll work with the most prevalent one in the next spread.